Solar energy in Asia has been developing faster than anywhere else in the world, however, the challenge to obtain access to capital remains. In thw 2018 event, by joining forces with the Asia Clean Energy Summit, we aimed to bring together all investors, financiers, solar developers, IPPs, EPCs and other solar stakeholders to discuss bankable PV projects in the region. For the Unlocking Solar Capital & Financial Summit, there were 200+ solar energy delegates present in our sessions, however, there was the opportunity to network with 1000+ solar and clean energy executives in Asia during the networking sessions. In addition to the conference held on November 1st-2nd, this fall there was the opportunity to attend the clean energy exposition held from October 31st - November 1st which will add an additional 3000+ visitors to network with. All together making a total of 4000+ solar & clean energy professionals present under one enormous roof. 10:00 Big picture: Summarizing last year: How much clean energy investments did Asia attract? Has there been a change of the game for investors and developers? 11:00 Transition towards market parity in Asia: What does this mean for project finance & development? 09:45 Innovation & disruption in solar finance: What are the alternative finance instruments for solar PV projects? Geoffrey Tan is a Managing Director at Overseas Private Investment Corporation(OPIC), and is OPIC’s Asia-Pacific regional representative based in Thailand. Mr. Tan has worked in emerging markets financing for over 20 years. Assaad W. Razzouk is a Lebanese-British clean energy entrepreneur, investor and commentator. He is Group Chief Executive and Co-Founder of Sindicatum Sustainable Resources, a global clean energy company headquartered in Singapore; the Chairman of the Board of the Association for Sustainable and Responsible Investment in Asia (ASrIA); a Board member of the Climate Markets & Investment Association (CMIA); and a commentator on climate change, natural capital and clean energy. Ruth P Briones is a climate change engineer and sustainability regulatory expert. Under her direct supervision and leadership, was the development of a total capacity of 1400.0MW of renewable energy projects in the Philippines and Asia. 1200.0MW of which are solar energy and 200.0 MW waste-to-energy and biomass projects. Currently, she is negotiating for PPP Waste-to-Energy projects in Indonesia and primary cities in the Philippines. This year (2018), she has started the development of agro-Solar PV - community based and micro-grid solar PV projects in the Philippines. In 2015, she was declared as one of the 40 Global Sustainability Superstars during the 2015 World's Sustainability Congress in Mauritius in December, and was conferred the "sustainability Leadership Award" in that Congress. Subsequently, she was listed and presented as one of the most impactful green leaders, globally, during the 2016 World CSR Congress in Mumbai, India. In 2017, she was presented the Sustainability Leadership Excellence Award by the international Management Excellence Council. After working with the Philippine Government for 25 years and with the Asian Development Bank, she was involved with several entities focused on climate change mitigation, sustainable environment, renewable energy development, policy formulation and research. She has also organized and created three companies focused on sustainability: Greenergy Solutions Inc, Living Projects for People Philippines and Firmgreen Phils Inc.
Ruth is one of the authors of the Berkshire Encyclopedia of Sustainability Volume VII- Public-Private Partnerships which was published in 2014. She also authored the framework of the Philippines' Zero Waste Agenda as scheme for circular economy and the sustainable community-based renewable energy programme for the ASEAN region. Unlocking Solar Capital: Asia will involve 200+ solar energy decision makers in the room and 1000+ high-level clean energy decision makers from all around the world to network with. It offers a range of opportunities to build and promote your brand to a diverse, yet focused group of high level international and local stakeholders including investors, financiers, project developers, EPC’s, IPP’s and manufacturers. Solarplaza has compiled an overview of the top 25 solar PV plants in Southeast Asia with the purpose of showing the market potential of solar power in the developing region, but therefore excluding the more advanced and developed solar markets in China, India and Japan. This list of solar PV plants comes in preparation of our 2-day conference, Unlocking Solar Capital Asia, set to be held in Singapore on the 1st and 2nd of November, 2018. To get an insight into the current status of solar energy and the mechanisms set out to drive its development, we hosted a webinar - ‘How to bridge the electrification gap in Asia through off-grid PV systems?’ - and consulted local experts. In an effort to show the strength of solar power in the region, the Top 50 largest Asian PV plants were collected. RE100 has grown rapidly since a handful of global companies — led by co-founders IKEA and Swiss Re, under the oversight of The Climate Group and CDP — vowed to derive all their electricity from renewable sources by self-determined target years. Download Baker & McKenzie's Client Alert on Vietnam's renewable energy policy by completing the form below. Thailand is Southeast Asia’s leading solar market, with 2.75GW of installations by the third quarter of 2016, according to the Energy Regulatory Commission (ERC). However, while the country is an attractive opportunity — the government is targeting 6 GW of cumulative PV installations by 2036 — muddled policies have complicated the short-term investment outlook. Development bank support is gradually allowing specialist solar-plus-storage companies to target a market with 1.2 billion customers. The Philippines can save $200 million a year and build a more reliable energy supply for millions of residents on its small islands by replacing diesel generators with renewable sources such as wind and solar, said a report released on Monday. PV MAGAZINE - The Sustainable Energy Development Authority (SEDA) has published guidelines for the new net metering scheme the Malaysian authorities launched in January 2016 to replace the feed-in tariff (FIT) scheme, which will close at the end of this year. PV MAGAZINE - A unit of utility Electricity of Vietnam (EVN) has announced plans to build two projects totalling 350 MW of solar capacity in southeastern Vietnam. PV MAGAZINE - State-owned utility PT PLN (Persero) signed agreements with six developers in late March to build PV projects throughout the Southeast Asian nation. PVMAGAZINE - Sri Lanka’s Ceylon Electricity Board has issued a tender for the construction of 60 PV power plants with a capacity of 1 MW each. Bids must be submitted by April 26. PV MAGAZINE - The Taiwanese company has agreed to start a feasibility study next month on the possibility of developing the country’s first floating solar array, in cooperation with UMILE Ltd Liability Partnership. THE STANDARD - Energy Logics Philippines Inc. on Thursday launched a 232-megawatt integrated solar and wind energy project in Ilocos Norte province. Solarplaza has been organizing events since 2004, hosting 100+ events in over 30 countries. This line-up includes 6 previous events all focused on unlocking capital to develop (new) solar projects in emerging markets and 17 previous events in Asia - including China, India, Japan, Thailand, Indonesia, & Vietnam. 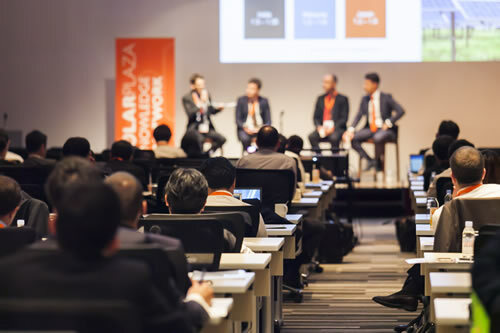 This year, Unlocking Solar Capital Asia merged with the Financial Summit, and will be a part of the Asia Clean Energy Summit and Singapore International Energy Week. ACES provide a common platform for regional thought leaders in both the public and private sector to collaborate on critical issues and opportunities in harnessing clean energy for the future. As the regional platform to share and co-create innovative clean energy solutions, ACES supports the vision to be a clean energy hub for Asia. The Singapore International Energy Week (SIEW) is an annual platform for energy professionals, policymakers and commentators to discuss and share best practices and solutions within the global energy space.